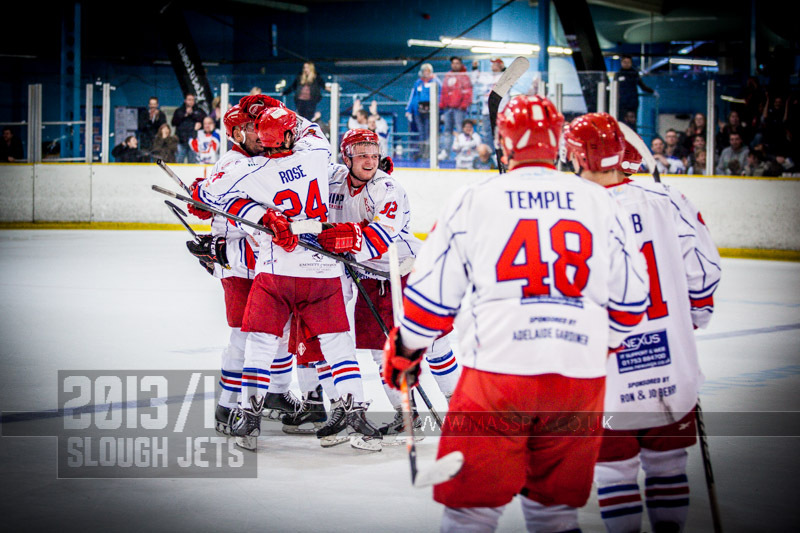 Slough Jets welcomed Guildford Flames to the Hangar for the final time in the 2013/14 season with the season series tied at 2-2. Both teams edged their ways into the game feeling out their opponents but Slough soon took the ascendancy through an Ales Padelek goal at 16.16. Guildford continued to pepper Andrej Vasiljevic in the second period but the Slough netminder denied shot after shot with Gregg Rockman also denying the 8 shots he faced. With 1.56 left in the period finally Marcus Kristoffersson broke the deadlock and levelled the game at 1-1. Both teams worked hard in the third period but it was almost inevitable that they would share the spoils with a point each at the 60 minute mark. Overtime started 4 on 3 as Andrius Kaminskas served the remainder of his third period penalty but with a total of 9 shots saved the game went into penalty shots. With Longstaff scoring, Kieras missing, Opatovsky missing and Line scoring it came down to the final 2 of the intial 3 shooters. Vasiljevic saved from Tom Duggan and Ales Padelek buried the puck behind Rockman for the game winning goal. With a single goal lead on aggregate from the first leg Slough made the journey to Basingstoke to complete the first semi-final of the cup competition. Slough got off to a dream start with Matt Towalski netting at 2.59. With emotions running high Nicky Watt and Aaron Connolly came together at 8.11 with both players receiving roughing penalties but the powerplay advantage falling to the visitors. Two further powerplay opportunities were benefiting the home team but they failed to capitalise and at 20 minutes Slough held the lead in the game and a two goal lead on aggregate. The second period saw Basingstoke up their pressure on Gregg Rockman in the Slough net and at 29.15 they levelled the on the night score with Joe Miller netting a delayed penalty goal. 7.05 later Jaroslav Cesky scored to make it 2-1 and bring the aggregate score to 4-4. Slough had managed to kill off 4 penalties and had one more to look forward to attempting to kill at the start of the final period with the period ending with Michael Wales penalised. Both teams picked up early penalties in the third period and neither was able to capitalise on any of the special team time they had and when 60 minutes ended Basingstoke had the win at 2-1 but the aggregate score was still 4-4 so the game went to overtime. The two netminders made some big saves in overtime forcing the game to penalties and Dan Davies took the first shot which was saved by Stevie Lyle. Cesky shot first for the home team and his shot was denied by Rockman and when Pliskauskas and Miller both failed to score it came down to the last round of the 3 shots. 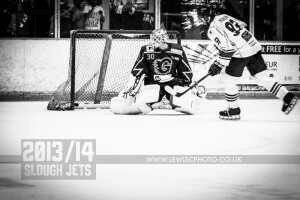 Frantisek Bakrlik casually netted his shot meaning when Rockman saved Chambers effort Slough had earned the extra goal they needed to win the semi-finals on aggregate and advance to the Cup final. Slough Jets lined up to face Manchester Phoenix missing Adam Greener, Alex Barker and Slava Koulikov while the visitors were missing their first choice netminder. Slough killed an early powerplay opportunity for their opponents but back at even strength Liam Chong make it 0-1 at 6.15 finishing from Richard Bentham. Gregg Rockman dealt with the other 8 shots he faced while Slough struggled to get the puck on Andrew Jaszczyk managing just 5 shots. Bentham struck a solo effort at 26.20 and then the visitors hit penalty trouble, giving away a 5 on 3 opportunity which provoked Tony Hand into taking his teams’ time-out. Mindy Kieras converted the double man advantage at 32.40 to pull back a goal for the home team but the remaining 5 on 4 was killed off and the period ended 1-2 despite Frantisek Bakrlik coming very close to equalising at 35.06 nobody saw the puck cross the line and bounce back out on a wrap around chance. Just 1.23 into the third period Manchester made it 1-3 when James Archer scored and at 44.17 the same player made it 1-4. Darius Pliskauskas scored at 45.39 reducing the deficit and through the period they pressured the visitors netminder while reducing shots on Rockman to just 7. Tom Duggan however made it 2-5 46.37 and Archer stepped forward for his hat-trick goal at 53.28 with a powerplay strike completing the night’s scoring. 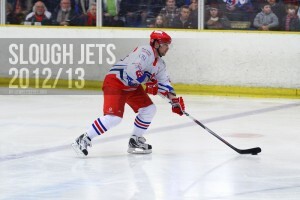 Slough Jets busy schedule continued as they started the weekend on home ice against the Peterborough Phantoms. Slough opened the scoring at 5.24 when Darius Pliskauksas netted at 5.24 but at 8.58 a powerplay goal from James Ferrara equalled the game. Peterborough then took the lead at 13.19 when Tom Carlon netted shorthanded at 13.19 and extended their lead with a goal from Joe Graham at 14.30 ending the period 1-3. Both teams battled through a middle period without score but not without action. Ryan Watt and Graham picked up cancelling minors for slashing and hooking before Adam Greener came together with James Ferrara at 31.26. Greener was rewarded with a match penalty for roughing while Ferrara received a 2 minute kneeing minor. Back out in the third period and Adam Calder scored 2 minutes in and when Mindy Kieras scored at 46.23 the game was level at 3-3. With the game looking to head to overtime Ondrej Lauko scored a shorthanded goal at 57.46 making it 3-4. Sheppard called the home team time-out at 58.37 and the game re-started with Rockman on the bench for the extra attacker. With 7 seconds left in regulation time Darius Pliskauskas scored to make it 4-4 and force overtime. Sudden death overtime lasted only 109 seconds with all the shots being faced by King in the Peterborough net. After a couple of saves Ryan Watt beat the visitors netminder to score the overtime game winning goal. 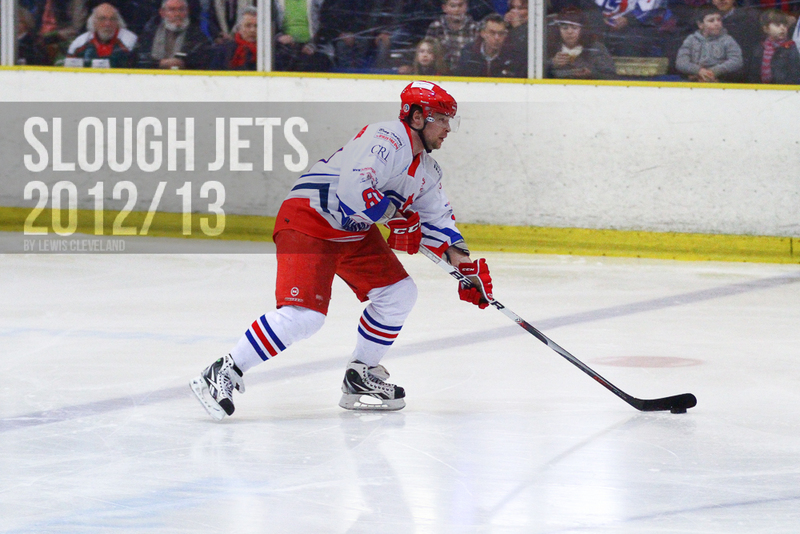 Slough Jets travelled to the Link Centre to face the Swindon Wildcats as the first game of a home and away weekend. An even period of hockey ended in the favour of the visitors as the Slough Jets powerplay goal from Darius Pliskauskas at 12.53 was the only goal of the period. The second period saw the visitors forge a lead as Pliskauskas scored a second powerplay goal at 29.43. Ryan Watt made it 0-3 at 35.54 and Pliskauskas scored his third of the night, a powerplay at 37.36. Slough’s run of games continued with a visit from the Peterborough Phantoms boasting many line-up changes. Both teams played offensive first periods with a combined 26 shots on goal but Gregg Rockman and Stephen Wall both ensured a scorefree opening 20 minutes. Scoring finally got underway in the second period as Slough were killing their third penalty Joe Greener fed the puck to Blaz Emersic who netted shorthanded at 29.01. The visitors were soon back level when Joe Miller scored at 30.43 but Paddy Ward put the home team back ahead with a powerplay goal at 33.13 and the period ended at 2-1. The scoring stepped up in the third period when Peter Jasik made it 3-1 at 41.31 but Peterborough pulled back at 43.59 through James Ferrara and then levelled with a Maris Ziedins powerplay goal at 46.09. Ciaran Long restored the lead for Slouh at 50.44 but with 2.39 remaining Miller scored his second to level again and send the game to overtime. Overtime lasted just 61 seconds and the first shot of the extra period settled the game as James Morgan scored that winning goal.